The deer season now over, it’s cold out, there’s snow on the ground and it’s time to focus on football and start tackling the honey-do list, right? I have always found that the best time to scout is the post season winter. It not only helps me to understand deer movement closer to the rut, it gives me a valuable data I can use for next season. Post season winter scouting gives me a clear idea what kind of food sources are being hit. For example, I carefully note all of my food plots during the winter. This helps me to plan for next season as certain plots do better in late season than the early season. By doing this we identified that our two winter plots were still producing forage. My two acre brassica plot we planted in August has been hammered but there is still a lot of quality forage available to sustain deer a little further into the winter. However the smaller purple-top turnip plot is seeing little activity. This information helps me to evaluate seed choices and plans for next years’ plot choices. The first thing we did is to check our plots and identify late season activity. Here I am walking my Brassica plot which is still drawing deer after the season has ended. But it’s not only about food plots. We also examine native forage, browse activity and movements to and from feeding areas. On our upstate NY property there are no acorns, but what we do have is apples and they were abundant this year. The deer were still hitting apples through December and that appeared to be our preferred food. By marking apple trees with different colors we could tell next season which apple trees produced early season, mid-season, and late season. This helps us tailor stand selection for the future. Timing your scouting trip is important. I like to scout as close to the season as possible and 2-3 days after a fresh snow. This gives me the best opportunity to map deer runs, deer highways, and bedding areas. We start at the perimeter of our property and mark all the major trails on the border. Then, by following those trails into the property we stop at all major intersections and take a photo with my Garmin Oregon 550. This is the latest map overlay from my Garmin 550. It shows photos, routes, and waypoints geotagged on a Sat photo of my 310 acres. The photos in the center represent a rubline we followed two weeks after the 2011 season ended. This particular GPS has a 3MP camera with GeoTagging. We also take photos of all fresh rubs so that we can identify rub lines when back home. I take a lot of photos while snow scouting trails and then overlay those photos back on my BaseCamp software on my PC. No more drawing maps and taking notes, all of that is done right on the GPS. BY overlaying that on a Satellite photo the trails start to make sense and so do the rublines. While I don’t pick all of my future stand locations in the winter, I probably choose 50% of them as a result of my snow scouting. There are differences between early and late season runs and food sources also will change. But the major runs, funnels, and bedding areas only change slightly during the winter. Foliage is also at a minimum in late season – allowing you to get a much better view of stand locations, runs and funnels. My son Matt is flagging a rub that has also been identified as a future stand location. We flag the trail and we flag the most appropriate tree. Sometimes we even clear lanes during our winter scouting trips. When a potential stand location is identified we will flag the most likely tree, and also flag the shot locations such as a run, apple tree, or natural barrier that diverts movement. We never hang the stand this far in advance but we will clear lanes and brush. Two tools we started using this year have been incredibly helpful and that is a cordless Battery-powered chainsaw and pole saw made by Black and Decker. We carry those in a pack and when we find a stand location clear the shooting lanes. Anyone who clears brush knows that it’s a lot easier in the cold without foliage. The most important thing to me is to understand what bucks made it through the season. That’s why instead of pulling all my Moultrie M100 mini cams on the last day of the season, I am busy refreshing the batteries. This past year we had two resident ‘shooter’ bucks on my 310 acres. A big mature 8 and another mature 12. I had 13 cameras running for two weeks with the sole objective of identifying which bucks survived. We were thrilled to see that our sanctuary areas did their job and both bucks escaped the rifle hunting pressure on neighboring properties. Using 13 Moultrie M100 mini-cams we identified that both of our shooter bucks had survived the deer season. Of the bucks we watched all season over 80% survived. This data is invaluable to us. Getting these photos is easy but laws must be obeyed. On my NY property, baiting at any time is against the law. 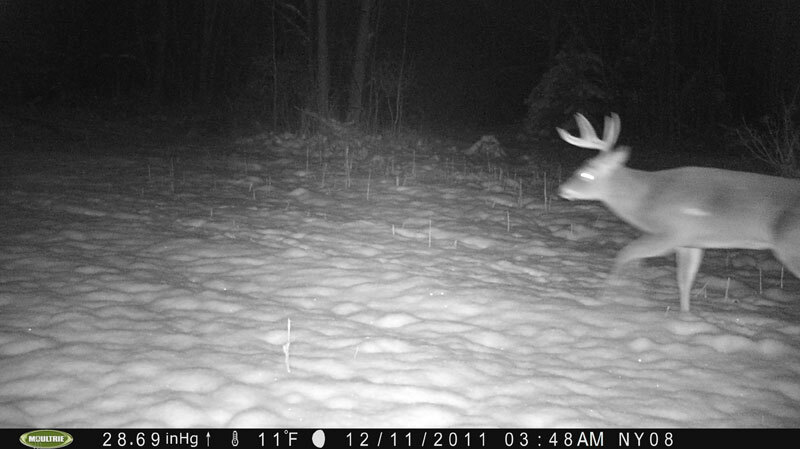 So I simply focused my cameras on the spots our bucks liked to travel. Since apples are natural, we placed cameras next to late season trees with fruit still on the ground and on my brassica plots where forage was still available. 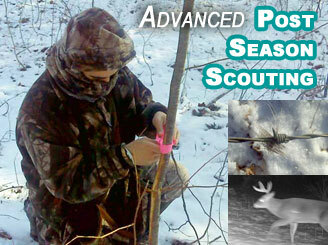 In states where off-season attractants is legal, identifying surviving deer is much easier. You simply set up a bait station at various locations with a camera and record all activity. By doing this on our managed property, I have identified that over 80% of my bucks made it through this years’ deer season. This was far better than we hoped and it demonstrated the success of strict disciplined sanctuary areas. While many may not think this is part of scouting, and it isn't, I combine my late season scouting with predator control activities. In most of the country the snow and trail cam photos will show increased coyote and bobcat activity. There are two reasons for this. The first is they are easier to spot in the winter due to the snow. The second is that predators need to step up their search for protein after forage dries up. This makes them easier to trap, call, and kill. 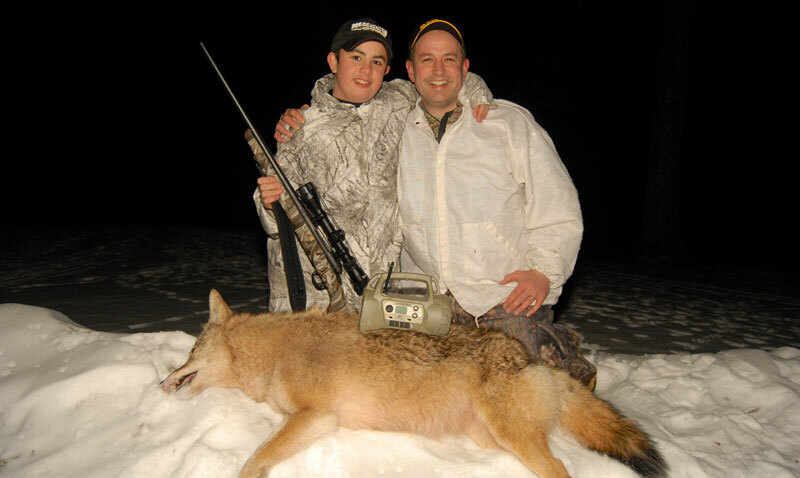 We allow a licensed trapper to kill coyotes on my NY land. But only after we have some fun calling and shooting them. We scout during the day but we also take some time out to kill coyotes. Here my son Matt took his first dog on his 12th birthday (and first day as a legal hunter). His 22-250 was his Birthday present and he used it wisely! On my land in NY, you can night-hunt for coyotes with a light and bait. 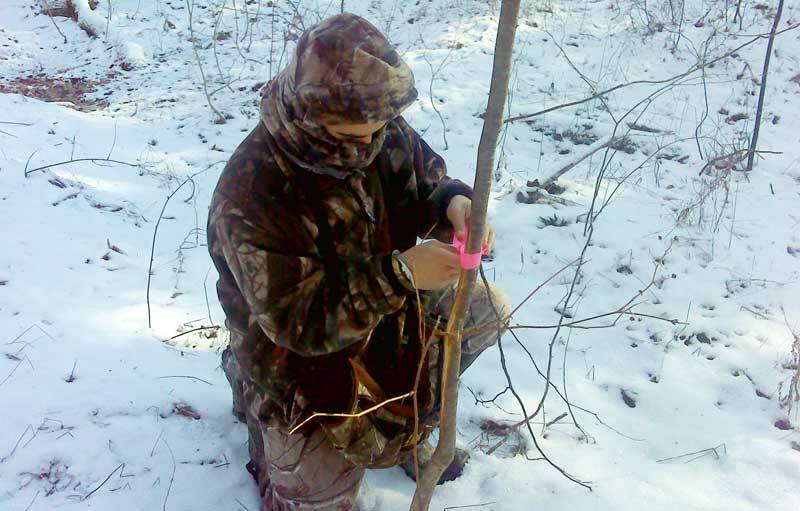 While some may not see this as sporting, I see it as nothing more than a tool to reduce predator populations in the winter in order to give our fawns a fighting chance come spring. We consider predator control to be the a vital component of any deer management strategy - besides, it’s fun to kill those slimy bastards too! So before you take the shape of your favorite winter couch understand that there is a world of data out there this winter that can make your 2012 season more enjoyable, successful, and possibly lead to that buck of a lifetime.